Available in capacities ranging from 100lb (50kg) to 1,000lb (500kg), including NTEP certified models, the durable CS750™ Crane Scale boasts an impressive 800 hours of continuous battery life (5,000 hours in stand-by mode), minimizing down time due to battery charging or replacement. 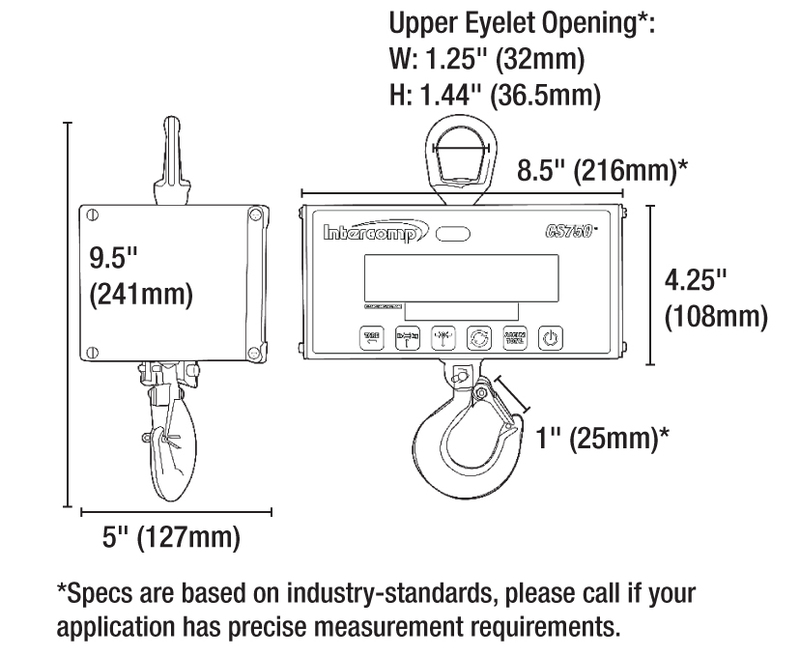 The unit can be ordered with or without Fully Integrated RFX™ Wireless Weighing Technology and comes standard with an infrared remote control, Crosby eye hook and bottom swivel hook. The large LCD display with automatic backlight provides easy-to-read weight readings, and a comprehensive set of keypad controls, including Tare and Accum/Total, make CS750™ Crane Scales the go-to solution for light industrial applications. All crane unit electronics are shock-mounted in a weatherproof case and provide maximum protection against moisture, dust and rough usage. Control Box – 4.25" x 5" x 8.5"